Iron is a mineral that is found in every cell in the body. It is an important part of red blood cells, which carry oxygen to all the cells. Our cells use oxygen to make energy from the food we eat. Iron also is needed to keep the immune system healthy and help brain cells work normally. Here are some foods and the amount of iron they contain. Both animal and plant foods contain iron, but our bodies absorb the iron from meats better than from plants. To increase the amount of iron that is absorbed from plant foods, eat them with foods high in vitamin C or with meat, poultry or fish. Some foods high in vitamin C include oranges, strawberries, and peppers. There are two forms of dietary iron: heme and nonheme. Heme iron is found in animal foods such as red meats, fish and poultry. Iron in plant foods such as lentils and beans is nonheme iron. This is the form of iron added to iron-enriched and iron-fortified foods. Heme iron from animal foods is absorbed better than nonheme iron from iron-rich plant foods. However, most dietary iron is nonheme iron. *Vegetarians should get 1.8 times the normal requirement for iron. For example, vegetarian men need 14 mg of iron per day (8 mg x 1.8 = 14). iron-fortified foods (e.g. fortified cereals) along with a source of vitamin C.
The iron in non-animal foods is not well absorbed. 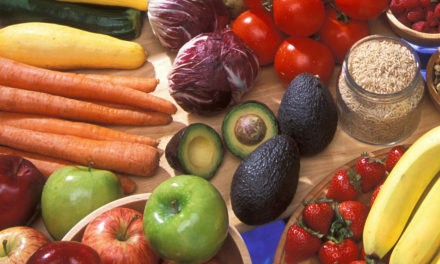 Vegetarian diets lack factors from meat that improve iron absorption. Therefore, it is important for vegetarians to consume plant sources of foods that contain nonheme iron, such as iron-fortified cereals and bread, tofu, cooked dry beans and peas, and some dark green leafy vegetables. A vitamin C-rich food should be included at every meal to help increase iron absorption. Oranges, cantaloupe, strawberries, green pepper and broccoli are examples of vitamin C-rich foods. Cooking food in iron pots or skillets allows some of the utensil’s iron to pass into the food, especially foods that are high in acid such as tomatoes, citrus foods and vinegar. Simmering foods, like soups and stews, for a while in iron pots or skillets also helps dissolve small amounts of iron from the pot into the cooking liquids. Red blood cells must contain adequate iron in order to carry enough oxygen to other body cells. Iron supplements are needed by some people, including pregnant women and people with an iron deficiency. If you do not get enough iron from food, then you may choose to take a multivitamin/mineral supplement that contains iron. An overdose of iron can be fatal, so always keep supplements out of the reach of children. Too much iron can be toxic to the body. It may cause nausea, vomiting, diarrhea or constipation. The liver can be damaged by consuming too much iron over a long period of time. Too much iron from supplements also can reduce the amount of zinc that the body can absorb. You should not get more than 45 mg of iron per day from food and supplements.